This game was a great laugh to play in and had everything. Monster tanks, heroic last stands, futile human wave attacks and a cavalry charge! And snow, lots of snow. 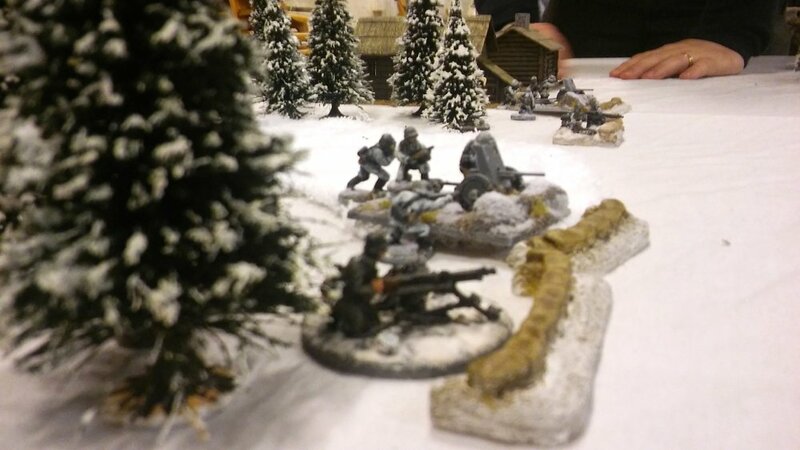 The scenario was quite simple: Andy, Ian and I had to liberate some of mother Russia from the evil clutches of Des and Daren’s Germans. To do so we had the always fun T-35 and T-28 tanks, a T-26 company, an infantry company and a Cossack company. The filthy fascist, imperialist invaders had a well dug in force liberally equipped with HMG’s, AT guns and a few tanks in reserve. Our plan was nice and straightforward in a Stavka approved way. 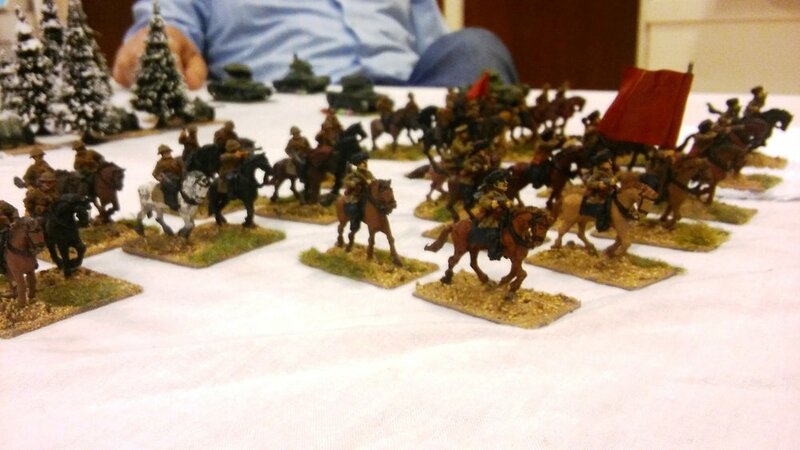 Andy’s Cossacks and the T-26’s would advance quickly on the left and engage the Germans to cause them to reveal their positions whilst our heavy tanks rolled forward down the middle to take them out. My infantry company was to work along the right flank, move one platoon through a wood to take out an advanced German position in the flank and use this as a jumping off point to roll up the rest of the position whilst the other two kept them busy – this flanking had to be done by the infantry as the deep snow present there made it impossible for the cavalry or tanks to do it. Obviously if Andy’s T-26’s could do the same over on the other flank so much the better. Things didn’t go well from the off for either myself or Ian. Ian started to receive fire early on and his tanks suffered from the off without managing to do much harm themselves, I recall turrets being taken out and a terribly glacial rate of advance which wasn’t helping the cause much. I did start to advance well but once I come off my blinds after being fired at I seemed to just sit there for ages without my cards coming up. It took a few rounds before I asked our glorious leader if they had actually added my cards to the deck, no was the answer and thus I could get moving once more. Andy was not having any such trouble and had leaped forwards and was trading shots with the Germans and was beginning to suffer from doing so whilst our remaining tanks got more involved in the fight but not in a really effective manner, indeed some dead eye shooting from the German PAK gunners and intervention from a Panzer 38 soon put paid to Andy’s tank force. 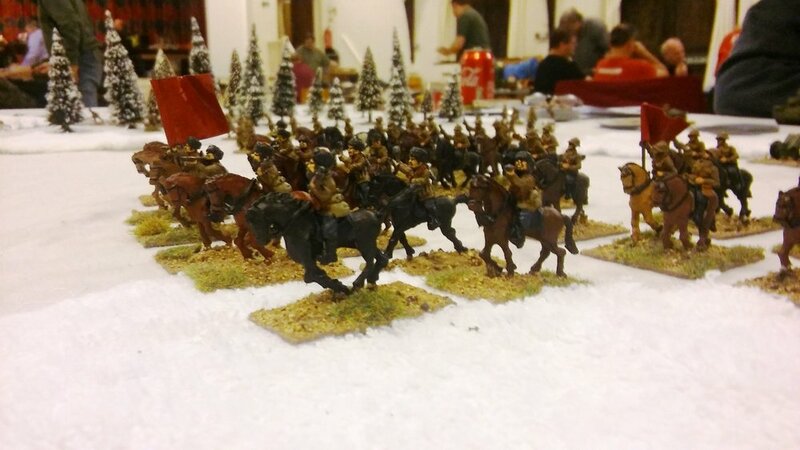 I eventually managed to get my chaps moving but came a cropper when executing my flank attack when an Iron Cross winning display from the battered German defenders put paid to my glorious charge and held on! It was about this time when Andy decided that some drastic action was needed if we were to carry out our mission and went all Dr Zhivago, mounting up his remaining lads and led them in an all or nothing charge on the German line. Surprisingly this didn’t end well either, the few remaining survivors limping back to cover and the battle was over for us as we decided we couldn’t break through. Bags of fun to take part in and great to see something different played, hopefully we will do some more sometime this year.